This year’s panel discussions at the Open Forum Davos were very appealing. 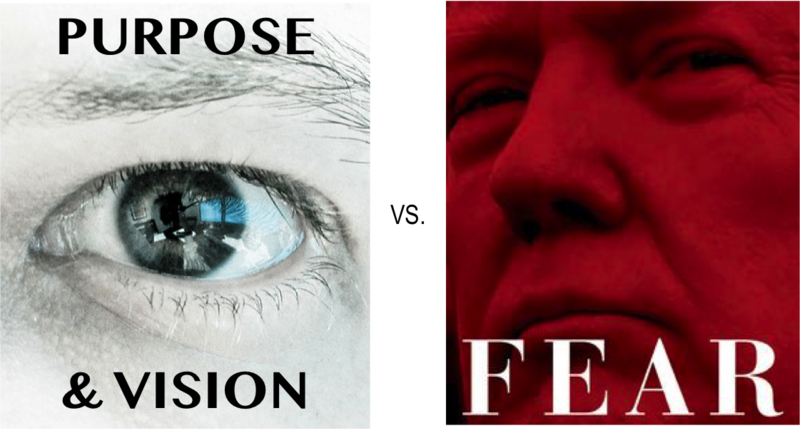 The WEF picked topics that were guaranteed to attract a large audience. Panelists were well-known celebrities and experts in the field. Unlike in previous years, audience interaction in the form a question and answer session was possible. And yet all panels faced a severe dilemma: panelists shared their ideas and described problems. Unfortunately, no solutions were being developed or portrayed. This was and is frustrating and disturbing. Frustrating because you could expect panelists to at least outline ideas for problems. Disturbing because it becomes very difficult if not impossible for the WEF to achieve the objectives of the Open Forum, namely “to develop the insights, initiatives and actions necessary to respond to current and emerging challenges”. What are some of the causes for this gap? For one, it is the way the facilitator is asking questions. Then, the panelists themselves did not really go out and offer too many solutions or food for thought that could inspire the audience to become active. Last but not least, audience interaction exists but is limited. As a consequence chances for “new insights, initiatives and actions necessary to respond to current and emerging challenges” were missed. 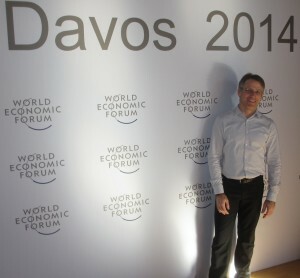 The Open Forum Davos not only addresses pressing global problems. Panelists spark a discussion for solutions and results. They offer new solutions, thus inspiring the audience to get involved, too. Following a Q&A session participants are invited to share their thoughts and ideas in an open workspace. The WEF facilitates this exchange of ideas. Either on site or virtually in an online community. Interested individuals or organizations can meet with like-minded people. The idea, however, is not to describe problems but to actively help those interested growing their ideas into concrete projects for social change. Progress of such projects could be tracked on a central online platform. 1-2 months prior to the next Open Forum project results can be displayed. Projects that made the greatest impact could be awarded by the WEF and presented in a special event at the next Open Forum. 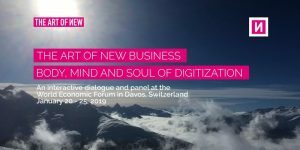 The Institute for Project and Business Transformation (name changed to “Human Business Academy for Today’s Economy” in December 2016)will reach out to the organization team of the Open Forum Davos and share the results of today’s “Chairlift to Innovation” workshop. In addition, we will finetune the vision and derive possible actions to be tested in a smaller environment than the Open Forum to test their viability. Please let us know if you, too want to get involved in improving the Open Forum Davos 2015 thus developing insights, initiatives and actions necessary to respond to current and emerging challenges on the global and local level. 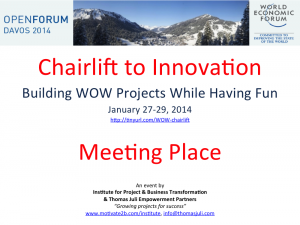 Today, 27 January 2014, was the first day of my workshop “Chairlift to Innovation“. I met with one other individual, who happens to work in the consulting world just like me. We decided to pick the topic of “Ethical Capitalism” as the overall topic of our workshop. After the first run and chairlift ride we qualified it to “Mindful Leadership”. We find that most companies these days limit their scope to the short-term gain and neglect the long run perspective. While this may work and actually could be quite profitable, it is not the idea we have in mind when we are talking about mindful leadership. Instead, it is important to take the long-term perspective into account when making short-term decisions. Long-term aspects include customer and employee satisfaction and happiness, customer retention, business sustainability to name a few examples. Both of us want to help organizations and companies to understand the value and need to take long-term perspectives into account when making decisions today. This is not a contradiction. It complements day to day business. 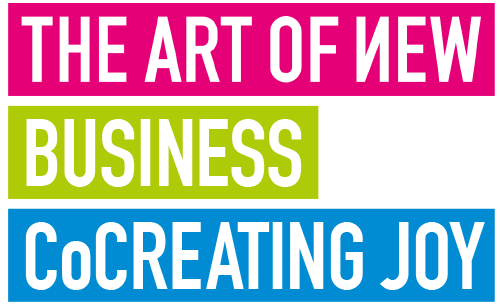 – For this purpose we will join forces building the Institute for Project and Business Transformation (name changed to “Human Business Academy for Today’s Economy” in December 2016). I will let you know shortly what concretely we have in mind. If you happen to be in the Davos-Klosters region and want to test the new workshop format and have fun at the same time, let’s meet at the top of the Gotschnabahn in Klosters at 10 AM. The meeting place is by the exit of the gondola building right before you exit to the slopes. Skeptical? Just give it a try. Or have you ever been in a workshop location directly in the mountains?! Have a look at the picture on the left: this could be your workshop space. Last but not least, if you are interested in more impressions of the workshop, check out my Facebook page. Tonight I attended the Open Forum Davos session “Higher Education – Investment or Waste”. Higher Education – Investment or Waste? Yes, of course, it depends. HOWEVER, if you look at the exploding costs of higher education you can get serious doubts if this can still be a good investment. Fact is, that higher education doesn’t guarantee you a job afterwards. And, due to the outrageously high tuition costs in some countries, it becomes increasingly difficult for “normal” parents to send their kids to college. Hence, while I would not go so far and consider higher education a “waste” I believe that we must not continue to downward spiral of exploding costs. invest in vocational training; after all, who says that everybody has to go to a university to succeed?! Interested in going beyond debating the hot topics of this year’s World Economic Forum? Why not share your ideas and turn them into concrete projects – and have fun at the same time!? Then join the free Chairlift to Innovation and learn how to grow your ideas into projects for success. Let’s meet on the slopes and chairlifts of the magnificient resort of Davos-Klosters and share our ideas and turn them into concrete project proposals – and have fun at the same time. After all, what better location could there be where you can integrate good ideas, physical exercise and natural beauty!? In case of a demand to meet in Davos at the base of the Jakobshorn instead, please call or send me an email. My local number is +41 76 798 53 21; my email is tj@thomasjuli.com. 1 day = 1 idea or problem to work on. 1 lift ride = 1 question / lift ride to discuss. 1 day = 1 or more concrete project proposals. We start our workshop with a brief introduction where I will the explain the steps of growing a WOW project. Now for the practical part: for each chairlift ride we pick one, and only one, simple question, discuss it on the lift, then ski or snowboard, meet at the base of a given lift, pick the next question and move on. This way we will be able to combine „work“ and fun at the same time. During lunch break we check our interim results. By 4 PM we should have a concrete project proposal. How good of a skier / snowboarder do you have to be? Intermediate and better skiing or riding skills are recommended. HOW TO FIND THE PARTY AT THE MEETING LOCATION? How can you find me? – I will be wearing a black jacket and green ski pants. Just show up at the meeting place. However, in order to facilitate planning it would be great if you could send an email to info@thomasjuli.com and express your interest in joining. Yes. We will form groups of 3-5 people. Call me or send an email. My local number is +41 76 798 53 21; my email is tj@thomasjuli.com. From January 22 – 25, 2014 the World Economic Forum Annual Meeting takes place in Davos-Klosters, Switzerland. The meeting brings together some 2,500 top business leaders, international political leaders, selected intellectuals and journalists to discuss the most pressing issues facing the world, including health and the environment. The 2014 topic is „The Reshaping of the World: Consequences for Society, Politics and Business“. The question is, what comes out of this meeting? Media coverage is guaranteed, provocative and not so provocative speeches will be given, experts have panel discussions, participants will be inspired (or not) by old and new problems and ideas alike. And then what!? Will it be like in most other conferences where people meet, network, listen to speeches, participate in discussions, just to go home and return to their daily routines? I reckon that in the majority of cases, this will be the case. This is frustrating and yet, not too surprising. Fact is that most conferences and seminars share the same fate. While the quality of such events can be outstanding, the actual outcomes and returns of them are miniscule and often negligible. What a waste of time, money and energy you are tempted to think. And it is true, it often is a waste – safe for the networking, good food, nice location and maybe even fun. The actual return on investment (ROI) remains low. – This doesn’t have to be this way! How can ideas spark innovation? I am lucky and honored that this time I will be in Davos. Not to attend the WEF Annual Meeting. I neither have the money nor the influence to get invited to this prestigious event. But I will be in Daovs-Klosters nevertheless. I will conduct a workshop for fellows of the Konrad-Adenauer Foundation with the title “Finding the Spirit of WOW Projects: Turning ideas into projects for cuccess and have fun at the same time”. What we will do is to pick some problems and ideas shared during the panel discussion “Ethical Capitalism: Worth a Try?” at the Open Forum Davos and grow them into concrete project proposals. I will show the workshop participants how to apply a simple yet very effective technique to get down to the real issues at hand and develop a foundation for WOW projects to evolve. 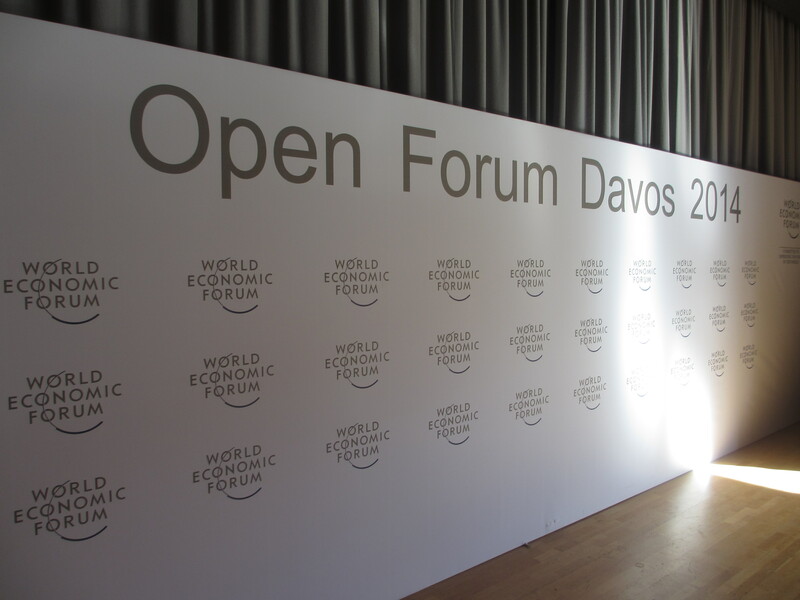 Time allowing we will present our findings and proposals at a debriefing event of the Open Forum Davos. And it doesn’t stop there: The hope is that participants will follow through with their project proposals and implement them. Where and how, will be decided in onsite. I want to continue this discussion. For this purpose the Institute for Project and Business Transformation and I would like to invite individuals who are interested in learning more about the technique of turning ideas into WOW projects. However, I don’t want to meet in a conference room. Instead, let’s meet in the resort, i.e., on chairlifts and the slopes of Davos-Klosters. What better location could there be where you can integrate good ideas, physical exercise and natural beauty. Planned dates are January 26-29, 2014. Please contact me directly if you are interested and want to join this select group.